1. A ball is thrown from the top of a building with an initial speed of 8 m/s at an angle of 20o below the horizontal. The ball hits the ground 3 seconds later. Horizontal movements are analyzed as uniform linear motion so that used the formula for uniform linear motion. 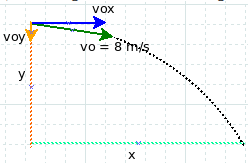 The movements of the vertical direction are analyzed as the free fall motion using the free fall motion formula. The box moves at a constant speed so that the resultant force acting on the box = 0. So the horizontal force = 150 N = kinetic friction. Kinetic friction works when objects move, static friction works when objects are still stationary. 4. A particle has a speed (3i-4j) m/s. Determine the momentum component on the x and y-axis and the magnitude of momentum. p is a symbol of linear momentum.